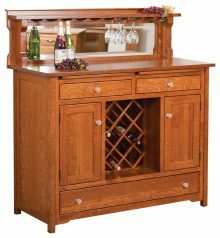 If you’re a wine connoisseur, a solid wood Amish wine cabinet allows you to keep bottles of your favorites within easy reach at all times. It will also prove to be an attractive conversation piece that will draw rave reviews from your guests. Choose from our large assortment of Mission and Shaker cabinets that are loaded with functional features such as lighting, adjustable shelves, dovetailed drawers and many others. 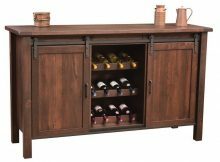 Our wine cabinets are made from your choice of superior, long-lasting hardwoods such as oak, rustic cherry, maple and hickory, which are some of the finest, most durable materials used in furniture manufacturing today. Our location in Smithville, Ohio, also gives us access to talented Amish artisans who know how to make furniture the right way. Your wine rack is sure to become a treasured heirloom that will bring pleasure to many generations of your family. Wine comes in fragile containers. It’s important to know you can trust the construction of the cabinets where you store your often-pricey bottles to keep them safe. 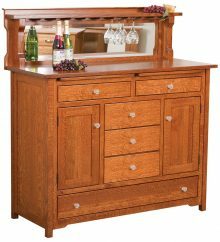 You can feel secure about storing them in our Amish wine cabinets made of solid wood. We use only the sturdiest and highest-quality materials in constructing our wine cabinets. Along with that high quality comes outstanding style. You can mesh your existing décor with the cabinets we have available, because there’s a choice to match whatever you have already. You can also use accessories such as crystal decanters, table runners and flowers to display on the cabinet and nearby furniture in order to tie the room together. Find frames that match the wood grain of your new cabinet to bring a fresh and fun look to the room while carrying over design elements. There’s a lot that goes into choosing the right bottle of wine, and there’s a lot that goes into finding the right display option, too. 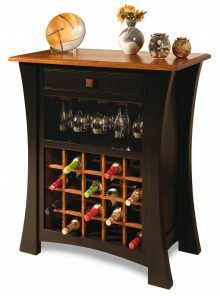 We offer a wide variety of solid wood wine cabinets because we understand every home is different. 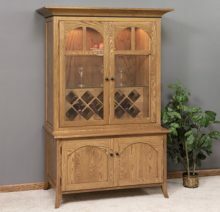 You want a cabinet that looks right in your home, whether your taste is traditional or farmhouse. We craft pieces that will look just right in any home. A practical option that will store many bottles? 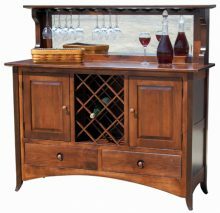 Then a buffet or wine server with a great deal of storage will be your best option. 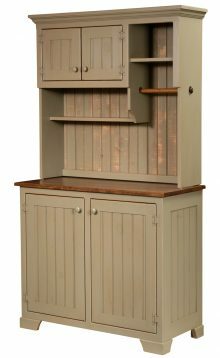 A small cabinet that won’t take up a lot of room in the kitchen? 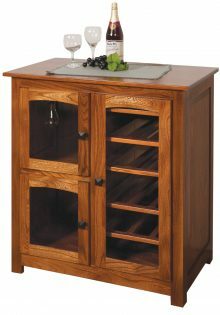 Try our skinny cabinets, such as the Mission Wine Stand in Oak. 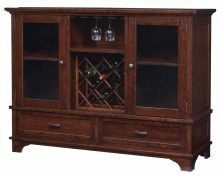 Our solid wood wine storage units look great in any room. Most of our customers opt to put them in the dining room or kitchen, because that’s where they drink their wine with dinner or as a post-meal relaxer. Some opt to put our cabinets in other places. They are so beautifully crafted that they can also serve a dual function as a gorgeous display piece. You may want to put your new wine cabinet in your foyer to show it off, or in a hallway between the dining room and kitchen as a conversation piece. There’s certainly no wrong place to put a wine cabinet. Even small rooms can house our Amish wine cabinets with ease. We offer smaller-width options so you can put your new cabinet comfortably in any room of the house. In fact, it may even look better in a small room because it really stands out. If you’re tired of paying way too much for your home furnishings, you’ll be pleasantly surprised at the affordability of our furniture. You can get up to 33 percent off the regular retail price of any wine rack in our collection if you place your order right now. 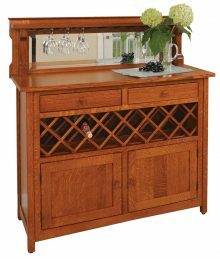 Combine your wine rack with other items in our Amish furniture collection to take full advantage of our large order discount, enabling you to save up to an additional 13 percent. 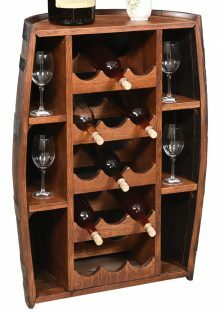 Check out our entire selection of beautiful solid wood Amish wine racks and order yours today!